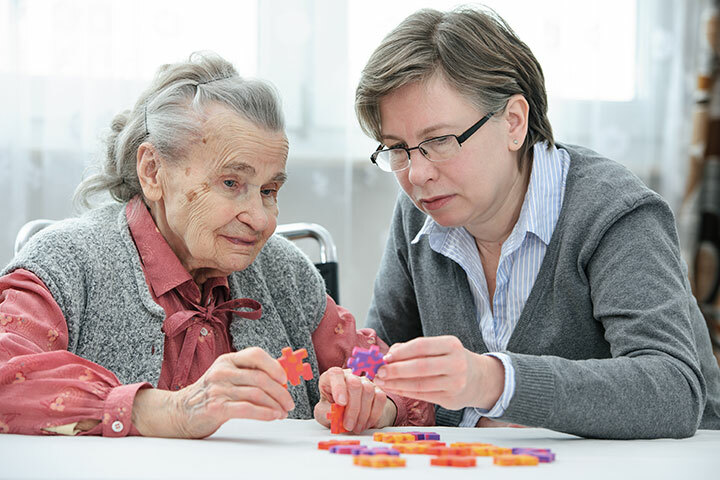 Mental exercise is extremely important for the health and well-being of elderly people. Just as the body needs physical exercise to keep fit, the brain needs mental exercise to stay active and alive. Brain game exercises and activities help stimulate the brain, and provide long-lasting positive effects regarding reasoning skills, memory and processing speed. Everyone loves to play a good board game. Though they might be very entertaining, they also have major health benefits including relieving stress and combating memory loss and depression. Board games can enhance memory formation and help exercise cognitive skills. They can also be low stress and calming. Puzzles are fun and a great source of engagement and entertainment for seniors. They’ll have the opportunity to exercise fingers and minds, and feel a sense of accomplishment. Seniors who have declined cognitively can still have fun with puzzles and our caregivers are ready to help put the pieces together. Creative activities are some of the most popular senior activity ideas, and what better way than painting and scrapbooking? Painting can allow seniors to tap into their hidden creativity skills and scrapbooking can allow them to walk back down memory lane. Both activities provide an opportunity to think outside of the box and get creative. Our core mission is to ensure our clients’ healthy lifestyle and well-being. Call us today at 877-947-2685 and ask how Home Care Powered by AUAF can help you or your loved one keep an active mind.